Below are the minutes from the latest Wincanton PACT Meeting held on Thursday 29th April 2010. These are the latest priorities decided at the last meeting. PCSO Maynard: We patrol the recreation ground and surrounding areas on a regular basis, but we need the community's help, we need to know about these issues when they are happening so we can deal with them. I urge the community to ring the police whenever incidents are occurring. We are keen to tackle these problems as they arise. By informing us, we will be able to enforce the 'Wincanton No Drinking Zone', and deal with any anti-social behaviour robustly. For all non-emergencies please contact us on 0845 456 7000. Area East Meeting Room, Churchfields, Wincanton. Apologies: Helen Rutter: Area Development Manager, Steve Brewer: Community Safety Project Officer, Jennie Bowie: NHW Co-ordinator. Present: Barry Taylor, Chairman, Pam Williams: Regeneration Officer, PC Andrew Brown: Beat Officer, PCSO Jenny Maynard: PCSO for Wincanton. Anna Groskop: County Councillor, Colin Winder: District/Town Council, Colin Bowie: Town Councillor. Steve Brewer: Community Safety Officer, Kerry Gray: Area Youth Worker, NHW Co-ordinator for Eastfield Rd, Members of public from Wincanton. Pam Williams: a preliminary plan has been created highlighting the hotspots for police calls relating to antisocial behaviour in the town centre. An engineer has been involved in looking into a variety of viable systems for the town centre. We should have costed illustrations, by the next meeting which will form the basis of bids for funding. Pam Williams: The planning permission for the site is due to expire in October 2010. Somerset Waste Partnership has been asked to renew this premission. The issue is the upkeep of the site once it has been erected, which is said to be in the region of £200,000 per annum. Due to the current economic climate, with budget cuts, funds are in short supply so there is no provision for a centre in Wincanton in spite of the District & Town Councils lobbying hard for this. An extension to the household waste kerbside collection will mean kerbside collection of plastic and cardboard will be introduced later this year. Anna Groskop: This still will not overcome the problem, due to the nearest recycling centre being at Dimmer, Castle Cary. The County Council must have funds due to Somerton not wanting their new recycling centre. Colin Bowie: It is not a clear message from the District Council. Pam Williams: It has always been a consistent message. The issue has been the running costs of the site. Colin Winder: There is a need for this site, so why can't we get some revenue from West Dorset and East Dorset for the site? Moor Lane Resident: Planning permission was turned down on the other side of the bypass for a resident that lived around there. This was due to the area being on green belt land. So why has this planning permission been granted? Moor Lane is not a big enough road to hold the amount of traffic that the recycling centre will cause, and it will pose a danger to pedestrians in the area. I agree Wincanton needs a recycling centre, but not on the Moor Lane site. Mike Young, Common Rd resident: He seconds the double standards in reference to the granted planning permission. If the new recycling centre was at the Wincanton Business Park, it would improve the carbon footprint of the residents in Wincanton (fewer vehicles). This is due to this site being a lot nearer to the new housing developments taking place. Chairman: so it seems that we are keen for Wincanton to have a recycling centre. Pam Williams: The necessary Traffic Regulation Orders (TRO) are in place and by the time of the next meeting it should be possible to give a start date for the on-site works. Colin Bowie: The road closure dates for Station Road crossing has now run out. Anna Groskop: Due to road closures in the town already, it wouldn't be a good idea to close Station Rd as well. It does seem that this crossing has taken a low priority. Pam Williams: The works shouldn't need an extended total road closure. Pam Williams: There is a review of how on-street parking enforcement is undertaken across Somerset. The projected timescale for parking charges to be introduced in Council owned car parks is May-June 2011 at which point car park and highway parking enforcement will be taken over by the local authority from the Police. Pam Williams: The Town Council have requested that a Speed Indicator Device (SID) is to be erected at the lower end of the High Street; the site is soon to be assessed. Due to the diversion in the High Street, it will be put up in the near future. Colin Winder: Is it possible to block off one end off Mundays Mead and Balsam Fields to create a cul de sac to stop the rat run. Highways are not helping the situation. Colin Bowie: After inquiring with Highways, they wont be willing to do this. Anna Groskop: Is there a possibility of speed bumps down the roads? Colin Winder: Vandalism in the skate park and drinking in the Recreation Area. 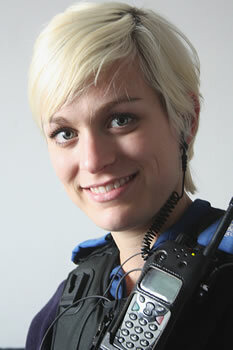 PCSO Maynard: We need to know about these issues when they are happening so we can deal with them. I urge the community to ring the police whenever incidents are occurring. We are keen to tackle these problems as they arise. By informing us, we will be able to enforce the 'Wincanton No Drinking Zone', and deal with any anti social behaviour robustly. For all non-emergencies please contact us on 0845 456 7000. Eastfield Rd NHW Coordinator: I would like to mention that we had an incident at Eastfield Rd, of doorstep sellers. They called at several addresses on Eastfield Rd, and were pushy towards vulnerable residents. I phoned the police and then later had an update to say that three males had been stopped in reference to this and dealt with. I think this was a very good result and would like to thank the police. Kerry Gray: I will be out and about in Wincanton on Wednesday evenings to get to know the local young people, and to hopefully organise a variety of activities with them. Mike Young: would like to raise a concern about the lack of fencing around the pond on the Brookvale Homes site next to the Scout Hut in the Recreation Area. It poses a danger to children due to the amount of water held at the bottom of it. The pit will be empty when finished however the Environmental Agency insist the outlet is stuffed with straw in case there is a spillage on the site during construction. The straw would prevent it reaching the river. However this means there will be a small amount water in the pit until it's finished. Traffic issues: Parking/speeding in and around the Town Centre. Anti-social behaviour in and around the Recreation Area. The next meeting will be held on Thursday 12th August 2010 at 7pm in the Area East Meeting Room, Council Offices, Churchfields, Wincanton. If you need any more information for the article please don't hesitate to ask.